This modern Solar Pit House is based on the traditional pit house. The construction is much the same. Additional ‘modules’ have been added to create an elongated rectangular design for added living space and windows added on the south for solar gain. Each module is based on wood posts set in geopolymer or concrete footings. Wood beams approximately 10”-12” diameter are joined at the posts with half lap joints and pinned in place with rebar or logging spikes. Smaller poles around the perimeter lean against the beams. 24” wide earthbag walls with a reinforced geopolymer or concrete bond beam rest on rubble trench foundations. The entire structure is surrounded by insulation and moisture barriers, both of which can be obtained as recycled materials.In this design, loose polystyrene is used around the perimeter, and home-made rigid board insulation is used on the roof and under the floors. Be sure to test the rigid board insulation so it doesn’t compress and cause cracking in the slab floor. - Sloping, earth-sheltered design has no vertical walls exposed to the harsh wind. This greatly reduces heating cost. - Radiant floor heating is the recommended heating system. At least one back-up heating system is called for due to the extreme climate – either a wood stove or propane heater. - A window wall separates the greenhouse from the main living space. Solar powered, heat activated fans blow heat from the greenhouse into the home, and cold air return vents draw cool air back into the greenhouse. - Double door airlock reduces heat loss. - The entry or mud room has space for coats, boots, shovels, snowshoes and greenhouse window insulation (possibly more polystyrene panels). - The entry vault helps block westerly winds and prevent drifting snow from accumulating on the greenhouse roof. - Pantry provides long-term food storage to reduce trips to the store. - Storage room for greenhouse supplies and potting bench. - Buried cisterns (not shown) with gravity flow design or back-up water hand pumps in case of blackouts. - Joseph Jenkins sawdust composting toilets greatly reduce water use. Water conservation is important since water deliveries are expensive and unreliable in remote areas. 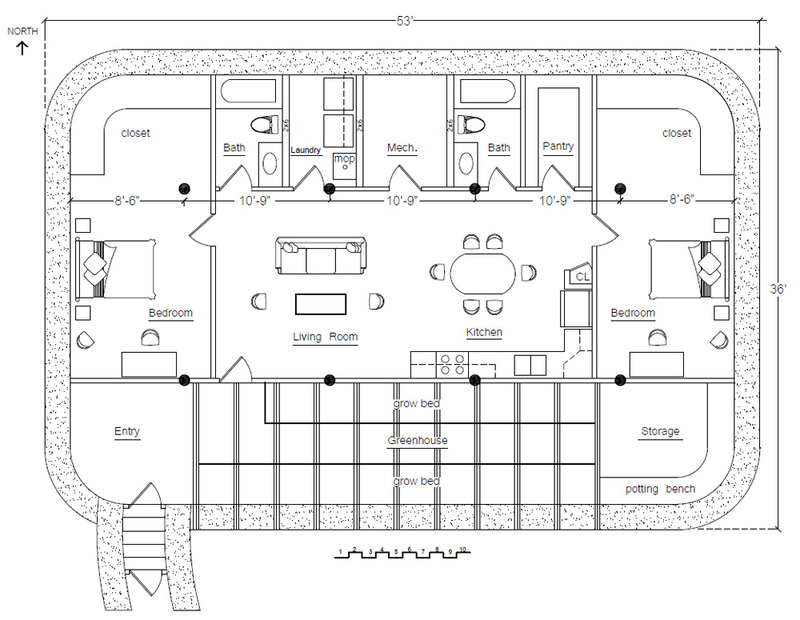 - Enhanced livability over current low income housing: traditional design for cultural acceptance; warmer (huge psychological boost when the floor and air temperature are always comfortable); more pleasant living environment with abundance of plants and much greater daylighting (combats cabin fever); fresh food production and higher oxygen level; superinsulated design with far lower energy costs (money stays in the community); adequate space for extended families and storage; greater self sufficiency. Thick, high mass walls and floor will absorb the heat, and a thick layer of insulation around all sides (including under the floor and on the roof) will trap the heat inside. You could even grow bananas or other tropical fruit with this sort of design. This Plan is offered for free. 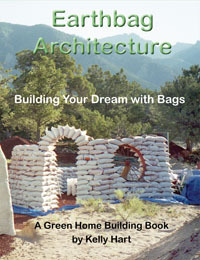 Either copy the images above, or go to www.naturalbuildingblog.com for detailed PDF plans.